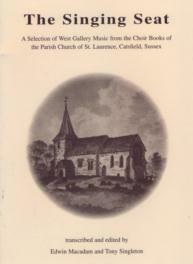 'The Singing Seat' is a collection of West Gallery music selected from the choir books of St.Laurence parish church, Catsfield, East Sussex. The books were written out in various hands by members of the church quire during the period 1820-1840 and were acquired by the Rev K H MacDermott in the early years of the twentieth century. His collection of books and instruments were donated to the Sussex Archeological Society at his death; the books are now preserved in their library in "Barbican House" in Lewes, whilst the instruments were in their museum in "Anne of Cleves' House" in nearby Southover. 'The Singing Seat' contains a representative selection of 20 psalms, 4 anthems or set pieces and 11 hymns from the choirbooks, including morning and evening hymns, two carols and two funeral hymns. The introduction gives details of the survival of the music books with a background to Catsfield and what is known of its church history and choir during the West Gallery period.